Due to it’s appealing weather at all times of the year, Greer, Arizona is one of those fortunate year-round destinations for travelers from all parts of the country, especially those residing in the desert lowlands of Phoenix and Tucson. The town with the state’s highest elevation (and among the highest nationwide!) at 8,356 ft., Greer, AZ weather is entirely different from that of Phoenix, which is just 4 hours away! 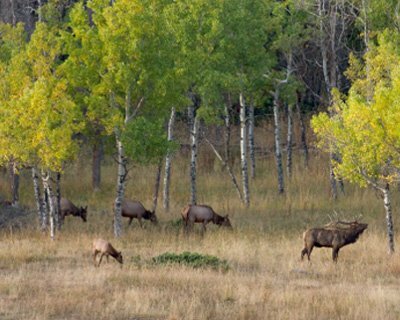 Cool summers and snowy winters provide joy to those seeking a change from the endless Arizona heat, while the local wildlife abounds as elk, deer, bears, wolves, and foxes make Greer their home. The stage is set for a perfect, relaxing escape into nature no matter what the season. Cool summers make Greer a delightful respite from the desert heat. Temperatures typically hit the upper 70’s during the summer, enabling all sorts of great outdoor activities. Hiking the many scenic trails of the White Mountains is a favorite in the area, while other activities like fishing, horseback riding, mountain biking, and zip lining are readily available throughout the region. Greer’s spot right along the Little Colorado River makes the town a delightful summer haven, as the occasional rain showers keep the stream flowing and the surrounding foliage a hearty green. Such blissful summer weather provides an excellent setting for those to soak up the fresh mountain air while enjoying the peace and quiet of the quaint town. * Average high and low temperature listed in degrees Fahrenheit. Though temperatures do dip slightly during September and October, the weather remains perfect for outdoor seekers. Highs hover around 70 in this season while a stunning shift is displayed with vibrancy in the trees. Foliage begins changing colors around this time of year and provides a serene collage of reds, oranges, and yellows, making Greer a simply stunning location in the fall. The best fall colors in Arizona are found here, as the local population of Aspen flourishes with a purely golden delight, capturing the essence of fall’s majesty in the White Mountains. Travellers can marvel at the colorful sights above while still enjoying all the great hiking trails and streams, before the weather truly shifts to winter. The cooler days also bring out the wildlife, so animal spotting can be a delight at this time. From mid-November through the end of March, Greer is often covered in a blanket of snow. This turns the town into a total winter wonderland, and provides Phoenix residents with a chance to truly experience the joy of this remarkable season! 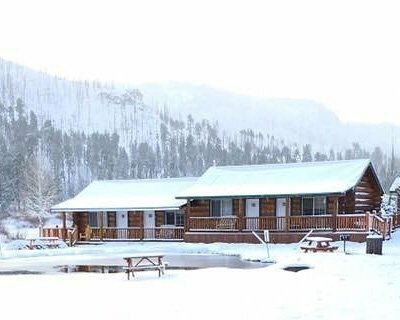 Cold temperatures pervade the area, reminding guests to relax in our cozy, warm cabins with a mug of hot chocolate and captivate the stunning snowy view outside the window. Kids can roam about in the frosted town, building snowmen, and perhaps take part in a snowball fight! For those more adventurous, the nearby Sunrise Ski Park provides excellent downhill skiing, while trails abound offering cross-country skiers a chance to work out and enjoy the blissful, serene woods. Greer averages roughly 8 feet of snowfall each year! This is your chance to experience a magical “White Christmas”, even in Arizona! Spring brings a breath of fresh air back to Greer, as cool weather replenishes the green surroundings and provides a charming and comfortable setting for fishing and hiking. Temperatures slowly rise as the spring progresses, but rarely exceeds the upper 60’s, while evening’s dip back close to freezing. Hiking is a very popular activity at this time as the beautiful wildflowers grow into full bloom, adding bright pastel colors to the lovely mountain scenery. Please take a look at our free hiking map of Greer, AZ to plan your next hike! The White Mountain’s second highest peak, Mt. 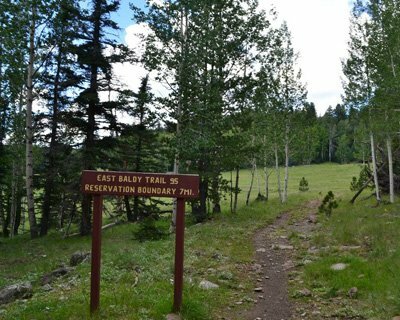 Baldy is many visitors’ favorite hike, though there are scores of great trails in the surrounding areas. 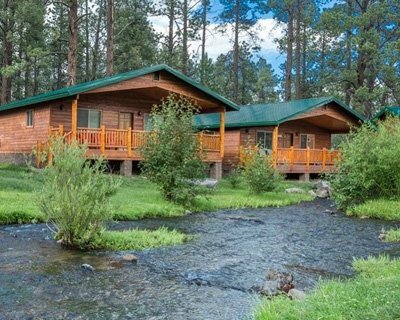 Spring also offers some of the best lodging rates for Greer Lodge’s cabins, so be sure to take full advantage of this season for your next mountain getaway!